“The country’s original conservationists, hunters and anglers, are still on the forefront of conservation. Our dollars spent on licenses, gear, and associated expenditures such as travel, bait and tackle, meals, and lodging has a tremendous impact on the state’s economy. According to the most recent survey of the USFWS about the economic value of fish and wildlife based recreational activities, we contributed $4.3 billion to the state’s economy while supporting over 46,000 jobs. “For years, the General Assembly has recognized sportsmen’s economic input and commitment to fish and wildlife resources by fully funding the state’s four conservation trust funds. Now conservation funding has been cut by a disproportionate 90 percent. Fiscal responsibility is important, but it doesn’t mean abandoning successful programs that have protected tens of thousands of acres of game lands, wetlands, fishing habitat and farmland across the state. 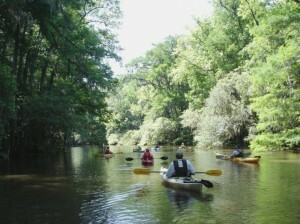 “In order to effectively safeguard key components of our economy, the sports and traditions that North Carolinians enjoy, and the health and integrity of some of our most important natural resources, it is essential that you restore a portion of these critical funds for the wild places that sustain our sporting heritage and economic impact. Restoring funding for the Clean Water Management Trust Fund (CWMTF) to $40 million, still well below historic levels. Removing the general prohibition on the use of CWMTF funds for land acquisition. Maintaining the dedicated revenue source for the Natural Heritage Trust Fund and Parks and Recreation Trust Fund, and oppose any diversion of those funds. But when members of the General Assembly look at this wide ranging and broad base of support, marshaled by the NC wildlife Federation (who, by the way, was also a co-signer on the letter to Perdue) that crosses all party lines and ideologies perhaps they will see that all North Carolinians treasure North Carolina’s wild places.